The wooden cherries on top of the toy sundae pose a choking hazard to young children. The recall includes about 22,000 wooden sundae sets, containing six wooden scoops of ice cream, three cherries that attach to the top of the ice cream scoops, banana slices, a spoon, and a bowl. 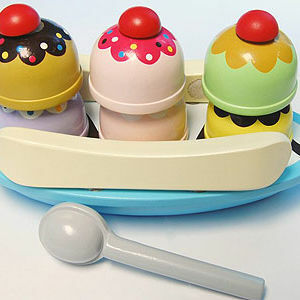 The ice cream scoops are green, pink, brown, yellow, and purple. The sundae set pieces attach to each other with Velcro. Model number DPCI-204-12-0526 is included in this recall and is located on the packaging. Target Stores nationwide from December 2006 through December 2007 for about $10. Immediately take the recalled toy sundae sets away from children and return the toys to any Target store for a full refund. For additional information, contact Battat Inc. at (800) 247-6144 between 8:00 a.m. and 4:30 p.m. ET or visit their Web site at www.battatco.com.